There is only snow in the sled and skiing area, so they did a tremendous job and moved 615 kvm3 (6620 cubic foot) of snow from the mountains around Oslo into the city. 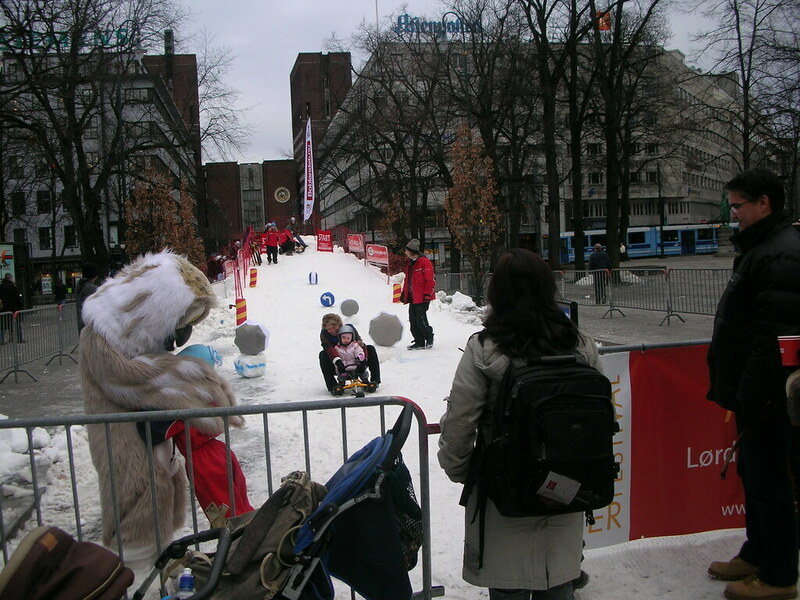 75 000 people visited to get a taste of winter joy and that’s great of course. 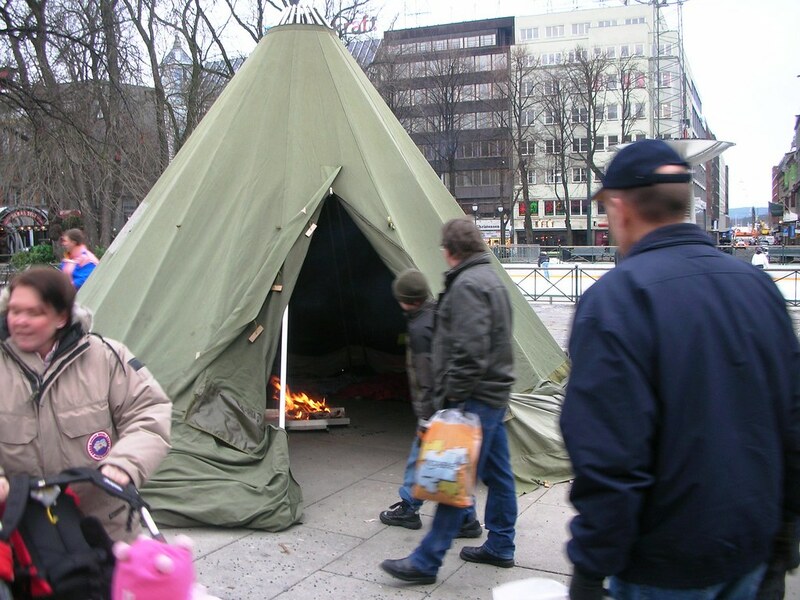 But about my memory lane: I felt it was kind of instant or artificial to see all this happening in Oslo’s main street though. I mean winter and fun with snow should be done in the mountains and forests, but of course as they say: Norwegian is born with skies on their feet, so why shouldn’t it be enjoyed in the more urban areas too. One of the co-arrangers was Skiforeningen (The Association for the Promotion of Skiing) – founded 4. 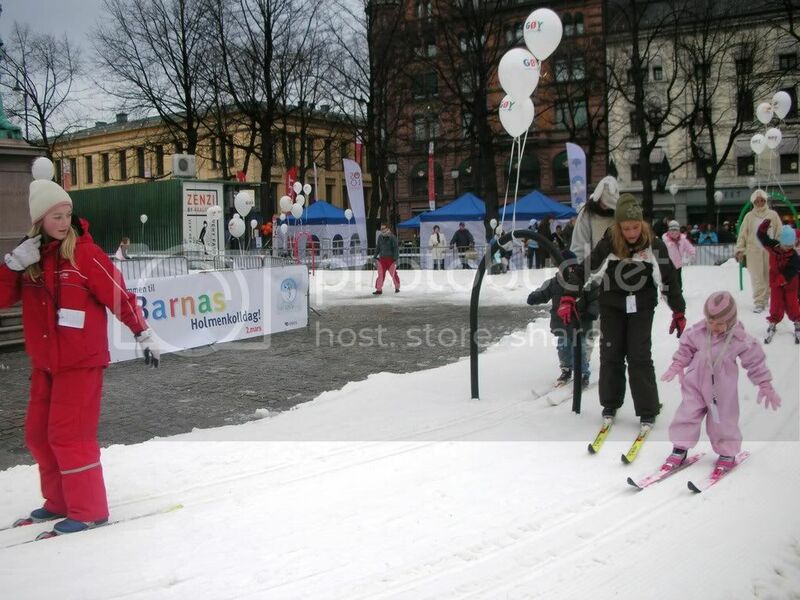 January 1883 in Oslo, with the cause being to promote skiing to the people and to organise the Holmenkollen ski races. You know the ski jump where our previous King Olav competed in the 1920s and also where the Winter Olympics in 1952 took place! 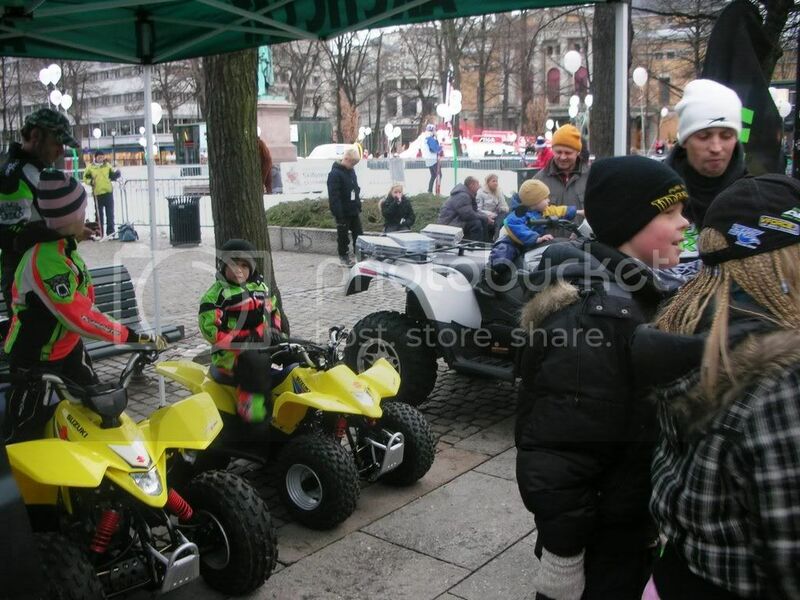 The smallest kids could at least sit on a four wheeler and even some Sami – The Native Nordic People – showed their houses (‘gamme’). Btw: This movee is an experiment. Please report if you had any problem watching/listening or if it took to long to download. Glad you liked it and it was great fun to see all these children having a blast in the snow. Too much or too little – all is bad – hope we soon get some normal winter weather. The video worked fine from my computer! Nice pictures Renny! Thanks for reporting back and for the compliments! We apparently have a mild winter here in New York as well. I guess it’s a trend on both sides of the Atlantic. My wife is from NY, up state and her family report the same so your probably right. Ah, yes, looks like it was fun – at least for the kids. Great work to move all that snow – phew! Not much snow over here either, it stopped snowing…. and now it’s melting away again. We’ll see if it comes back! The kids yea, and that is the most important you know – to give them a good start! Thanks for your report about the vid! Hmmm, I had a problem with the video. Clicked on start…nothing. I’ve had problems trying to upload videos, too. Anyway, it’s interesting to see what you Norwegians get up to in the winter…even if the snow had to be moved into place. Your problem with the video probably have something to do with your internet connection speed – you have to wait quite long to download it. Come over to Jessheim. We have lots of snow!!!! Hi AL good to see you! The video worked just fine– most enjoyable! I can’t believe that had to bring in snow, but so glad they did as it brought you much joy. I love to watch ski jumping on TV– it’s a wonderful sport. Glad the vid worked and that you liked it! Love ski jumping: Your my kind of woman Lisa! I think its great that the city children get a chance to play in the snow on a day they can’t get to the mountains!! Skiing in the middle of the city is crazy fun, you know!! Thanks for supporting my new blog!! As long as it encourage them, I’m happy with it too!! Your welcome dear – that’s at least what I can do!! I am surprise that there isn’t much snow as compared to America and China as they are currently suffered the worst snow storm in years. I know, I have many snow reports from my friends in Northern America – a strange winter season so far I think. Hey looks like a cool festival to me, as I have no snow I’m still jealous! Can’t see vid but that cos my connection is rubbish. Glad I could share some snow with you then, but sorry you could not see the vid. I don’t blame you – would have loved to be in India with you too! It is really amazing that even in your country there is no snow or at least not like usual. I have to say that I haven’t seen real snow here in Belgium since at least 3 or 4 years and then it only was a few cm not enough to make a snow man. I remember that in the 60th and 70th we had a lot of snow sometimes up to 20 cm, but that seems to be gone forever ! I know weather changes over decades, but I don’t like the warmer tendency – at least in the winter time. Hope the good once comes back ! oooh snow! so much fun! but china and america are having a hard time with too much snow. I know it various and have had a lot of snow reports from my blog friends in Northern America. Ah, Mr. Director, now that I know that I have triple roles in life which would be Assistant Network Evangaliste, assistant Director, and AUTHOR…MY LIFE is so much more interesting! Now if you had any idea how crazy my life is…I wake every morning at 4:00 am because the book is writing itself at 4:00 am. And there’s a movie going on in my head! It was yours…. Well, working with you is a pleasure and a thrill too – I’ll get back to your note in reasonable time! What a task moving so much snow, but I am sure that many thoroughly enjoyed it. We had a few light flurries, but nothing that settled, most of the time it is just rain, although in the north of the country they had a few problems with the snow. Typical in the UK, a bit of snow and everything stops! Wish you a good one too Colin! it sounds like a fun festival. i am still giggling at the irony of trucking in massive quantities of snow for it though! most people would be hauling it away! LoL: that’s how it goes with a Nation with people who are born with skies on you know! Well, its a yearly festival – welcome to join me next year! Well, there is still some left of the winter season – let’s hope! Thanks so much for the Award Thess – what an honour – I’ve collected it on my Award page! Wish you a good one too! You have a point there Caledonia: Also ski slopes in Norway have good snow – they are fare from the coast line and up in the mountains though. yup. can’t see it. and who really misses snow?…oh. me. Sorry you could not see it – hope you’ll give it another try! I had a little problem with the movie – it stuck in the middle with a black screen, but I refreshed the page and next time it was OK. I do think Photobucket move from one picture to the next a little too fast. I noticed the same with the slideshow I did but there doesn’t seem to be an option to slow it down. Anyway, to your post, which was as interesting as ever. It’s been a mild winter here too and in fact I saw the first daffodil in bloom today, in a sheltered spot. But mild winters have been the story here for several years now. I’m surprised really that you need to promote skiing in Norway :) It seems like preaching to the converted to me! Thanks for your feedback on the movee – glad you did not gave up! Thanks for your compliments – always try to give my readers some substantial information you know. To be honest, I hope there still will be some month before we see the spring flowers here – but who knows – I’ll keep you posted. I liked your saying: ‘Preaching to the converted’ LoL, but there is always a new generation you know! I’ll blog about it later this week. I do agree, Oslo and Ottawa is a perfect match! Looking forward to your Winterlude report – keep me posted! i’d love to experience snow someday. i nearly did but in simulated environments. in this part of the world, it’s mostly sunny! Your welcome to visit and experience real snow any time! oh wow. i’ve always dream of experiencing real snow. unfortunately, i live in a country where there is none. I love SNOW !!! It’s so COOL. So we are two of a kind then – great! It looks like a GREAT time, Renny…..”COLD”, but very very Festive! I love your little ‘movie’…..Thanks Renny, for always sharing these very interesting and fascinating things about your beloved country! Glad you liked it and remember Cold is no problem, if you have the right clothes. Thanks for your compliments too; I promise to keep on sharing! Seeing these pictures make miss winter now in Norway and I really hate it to be here in the third world with the warm weather and all. I need to be really back home really soon! Winter is indeed fun . . . I’m sorry you haven’t had much snow, Renny, but at least you have this wonderful festival. I really enjoyed the “movie”. The native Nordic house is really interesting to see. I hope you’re having a great week, my friend! Renny, this is a beautiful post from Oslo. I did love your Photoshow. But’ it is a pity you could not use Snow Crystals instead of Baloons for this spesific presentation. May be something to propose to the programmakers? btw. I had to walk to the Office to day. That was a risky walk. Ice with water upon. Normally it’s a 10 minutes walk, but today it was 25 minutes. My Car is in for service. Hope it will be ready before the weekend— Don’t know yet. hello me again. i have more gifts 4u. Very enjoyable post. I would love to visit Oslo someday. Not in the winter though. I’m a warm weather person. Your slideshow was great. It moved a bit fast but I kept up. Hello… I always wanted to play in the snow. We have no snows in here since we are in the center of the globe, very hot. Hehehehe… Nice pictures you got there… I am from Philippines. Oh, Poor you! They should have held iy here where I am this year! Our schools just closed for about the 5th time this year after 30 more cm was dumped last night! We have not gotten to know each other very well as yet, but, I do see in the above comments that we have a few friends in common. The video worked great for me and I truly enjoyed a peak into your world. As my roots are German mixed with Native American I think I am natually drawn to cooler climates. The ten years we resided in Maine here in the U.S. were absolutley some of the best times of my life. Now we are back down in the midwest region. But, we too are experiencing very odd weather. Already I have had my air conditioning running at least twice this months,flowers are strting to bloom,the robins have arrived. So everything indicates a very,very early spring for us. As I live in Tornadoe Alley an area that encompasses the entire mid region of the U.S. sometimes our springs can be very exciting and often times frightening. Thanks for a simply wonderful share!! Thanks for the invite – I mean, I’ve been to your festival blog post and it was amazing. Hope others visit you too! This festival looks like so much fun! We’ve had no snow at all this year in London (not even a tiny bit) so it hasn’t felt like winter at all. Sorry you could not see the video – hope you’ll try it later! I live in Los Angeles, California. If we had any snow everything would come to a stop. Boy, would that be something to see snow in Los Angeles! I did live where it snowed allot in northern California, it was great at first but then it got really old! I love to visit the snow but I don’t want to live in it every again! I loved the pictures, they were great. Thanks for sharing them. I am glad that you love the snow. You want snow?! Come on over here, Renny! We had two storms last week (which I thankfully missed!) so we have snow to spare. It’s really cold too! Great pictures! Looks like it was a lot of fun.